Accepta 2511 is a high performance eco-friendly cooling water corrosion and scale inhibitor scientifically formulated for the treatment and protection of cooling water systems operating under soft water conditions. Accepta 2511 incorporates a highly effective dispersant and corrosion inhibitor for cooling water systems operating under naturally soft or blended artificially soft water conditions. Accepta 2511 is stable to chlorine and bromine at the levels normally found in cooling systems. 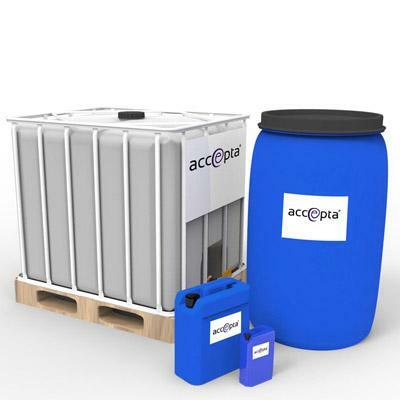 Accepta 2511 is considered eco-friendly and exhibits an excellent environmental profile as it does not contain heavy metals, phosphates or nitrite. Dose Accepta 2511 to give 100 – 150 ppm in the system. When starting up a new system or re-starting an existing system apply a dose of 300 ppm. Requires that the system water has a minimum of 50 ppm hardness. Always consider the cooling tower manufacturers control limits. Accepta 2511 is compatible with most cooling water treatment products. Test for phosphonate ( 6.3 ppm as o-PO4 at 100 ppm) using the phosphonate micropipette method. For further technical assistance concerning Accepta 2511 please contact Accepta.